By David P. Sylvestro, C.S.P. and Hallie A. Buckingham, Ed.D., with Eve Kessler, Esq. As if being a girl in a boys’ world isn’t hard enough, how about being a girl with LD in a mean-girls’ world—a world without the sugar & spice, where girls are not so nice? For these girls, life can be challenging; unless social skills are specifically taught, they may find themselves struggling to have healthy relationships as they mature. When it comes to social development, girls with LD have unique challenges. Unlike typically developing kids, they don’t pick up by osmosis the skills they need for smooth social sailing. Instead, they tend to have difficulty reading body language, resolving conflicts, and advocating for themselves; they often misinterpret association for acceptance, and struggle to understand passivity and aggression. If these social deficits go unaddressed, young girls may grow up finding it difficult to develop meaningful friendships and intimate relationships. Up until age four, boys and girls express aggression and anger similarly. After age four, however, girls are encouraged to be nice and to bury strong feelings and angry emotions. Consequently, they begin to seek non-physical—but equally effective—ways to express their negative feelings. These behaviors, termed “relational aggression,” aim to harm others by manipulating relationships, injuring feelings, or damaging reputations. 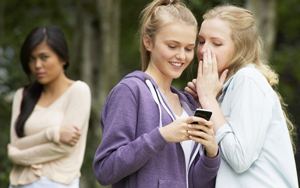 When girls are angry they may give others the silent treatment, spread rumors, ostracize a particular peer, or exclude them at the lunch table. Research shows that, unfortunately, relationally aggressive behavior often deprives girls of opportunities to meet their needs for friendship and intimacy, both of which are important for their emotional health. Such behavior may also make girls feel powerless, hopeless, lonely and isolated, angry, rejected, depressed, frustrated, and anxious. Consequently, it may cause interrupted identity formation at a crucial time of development, often resulting in poor self-esteem, substance abuse, self-injury, eating disorders, delinquency, suicidal ideation, teen pregnancy, and poor academic performance. How can we empower our girls with LD to make and sustain healthy female relationships over time? The goal is to help them develop the “language of social problem solving,” which includes affective (and effective) vocabulary, active listening skills, emotional intelligence, and empathy. The best weapon against relational aggression is to keep an open line of communication with your daughters and to make sure they know they can turn to you for a sensitive listening ear and count on you for sensible, level-headed advice. It’s particularly important for parents of girls with LD to pay attention to their child’s social development, and to address issues as they arise. Find the time to listen. Girls need validation, not judgment. Practice patience and restraint. Don’t over-react. When emotions are running high, you are likely to respond ineffectively. In order for your daughters to tell you how they are really doing and what they are really feeling, you need to listen calmly. Attach words to emotions. Teach gradients of emotions and feelings: “How angry were you on a scale of one to ten?” Help girls identify and give voice to the real feelings engendered by a situation. “What did you feel: Enraged? Irritated? Frustrated? Confused? Rejected? Betrayed?” Explain that we can’t help feelings and it’s okay to have feelings, but if we can identify the underlying feelings appropriately, we can make better choices regarding how we respond to them. Set a positive example, and encourage the school community to use and demonstrate the vocabulary of positive interactions. Live every day with kindness, integrity and tolerance. Encourage the school community to embrace a code that espouses: Sensitivity, Honesty, Acceptance, Respect, Responsibility, and Empathy. This article is based on the presentation “Sugar and Spice and Some Things Not-So-Nice: The Sometimes Confounding Make-Up of Girls with LD,” given by David P. Sylvestro, C.S.P., school psychologist, Eagle Hill Greenwich and Southport, and Hallie A. Buckingham, Ed.D., Upper School Head, Eagle Hill Southport, sponsored by SPED*NET Wilton. Eve Kessler, Esq., a criminal appellate attorney with The Legal Aid Society, NYC, is co-founder of SPED*NET, Special Education Network of Wilton (CT) and a Contributing Editor of Smart Kids.